Ahead of the meeting, protesters against the Northern Pass Project and Canadian oil extraction in the Alberta Oil sands gathered to express their dissatisfaction with energy development proposed for the region. A group called a Tar Sands Free Northeast - made up of a coalition including 350.org, the National Wildlife Foundation, the Natural Resources Defense Council, and New Hampshire Audubon, among others - gathered about 80 protesters mostly from Maine, Vermont and Massachusetts. They sang songs, waved signs and gave speeches across from the Mount Washington Hotel on Sunday afternoon. Jim Murphy with the National Wildlife Federation told the crowd to ask their governor’s to keep Canadian oil out of the New England fuel mix. "It is estimated that by 2020 as much as 18 percent of our fuel mix could come from tar sands derived fuels," exclaimed Murphy, pulling from a study done by the NRDC, " Tar-sands derived fuels is much more carbon intensive than conventional fuels." 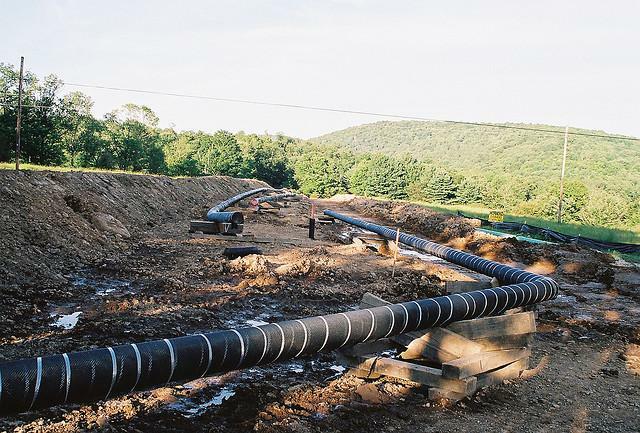 The activists were not solely focused on tar-sands however, which are not listed on the agenda for the conference, but some also spoke out against a proposed build-out of natural gas pipeline in Massachusetts. "All the New England Governors signed a letter to NEPOOL asking that they increase electric rate-payers fees in order to pay for Kinder-Morgan and Spectra to be building these pipelines," Dorian Williams with the Massachusetts-based Better Future Project told the crowd, eliciting boos. "It is not in the public interest, it is actually incredibly destructive to the public, so the fact that we would be paying for that infrastructure is abhorrent." Meanwhile, just down the road, a second protest gathered. A group of opponents to the proposed Northern Pass project - which would connect hydro-power dams in Quebec to the New England electrical grid - waved signs to passing cars. Will Abbot with the Society for the Protection of New Hampshire Forests said a group of passing Canadian journalists had stopped to ask about the project, and had never heard of the proposal. "So if we do nothing else today, other than educate the folks who are visiting from out of state and out of country, that's a success," said Abbot. Though the protest did have a goal of exerting pressure on other New England Governors. "We hope that the governors will follow Governor Hassan’s lead in suggesting there may very well be a better way of doing it than what’s being proposed," Abbot added. The conference will consist of two sessions: one on energy and a second on trade, and results in non-binding resolutions between the Canadians and Americans. Last September the delegates signed one such resolution emphasizing energy efficiency and trade in "clean energy".